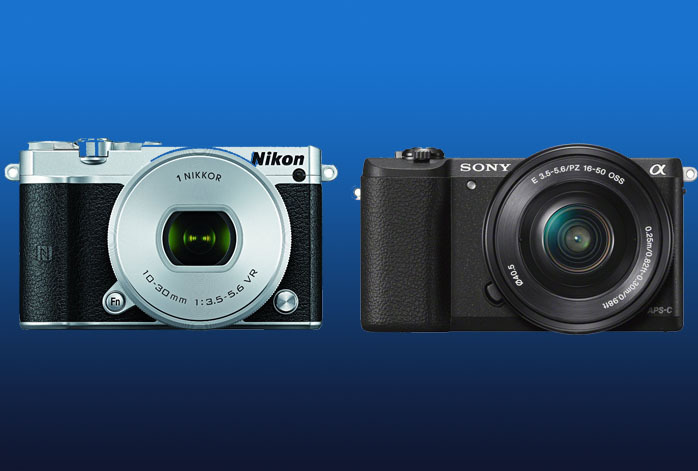 A lot of people hesitate upon choosing between Nikon 1 J5 and Sony a5100. No wonder. They are being priced almost similarly – well, Sony a5100 is pretty more expensive than Nikon 1 J5 by about a hundred bucks or so – and they each pack distinctive edges. Both are also very popular on the market, each having a good number of positive reviews. Well, you should know that Nikon 1 J5 and Sony a5100 are very different from each other, so read the following comparisons before you make a choice! In general, these two products come with an exceptional image quality. They can produce sharp and detailed images with strong and accurate colors and shadows. Yet, even so, we need to note that Sony a5100 is able to produce slightly better images than Nikon 1 J5. First, Sony a5100 comes with a more powerful image sensor, 24 MP APS-C sensor as opposed to Nikon 1 J5’s 21 MP sensor, so it is able to deliver better sharpness and details. Its pixel area is also a lot larger, making the color depth and the dynamic range quite better. For taking pictures of sports and fast-paced actions, you usually need a fast camera. It should have decent continuous shooting speed and shutter speed. Nikon 1 J5 is not only decent; you can say that it is the beast of the price range. How could? Well, it comes with 60 fps photo burst and 1/16000s maximum shutter speed! You can hardly find anything that fast, at least in the price range. With such power, Nikon 1 J5 can effortlessly capture the best edges of moving objects. Sony a5100 only has 6 fps photo burst and 1/4000s maximum shutter speed, so it is neither good nor bad. While Nikon 1 J5 shines in speed, Sony a5100 glows in colors. One great thing about Sony a5100 is that it supports AE Bracketing (Nikon 1 J5 does not). The feature allows the camera to capture multiple shots with different exposure values in order to get all the details and colors of objects in varying distances. This is especially useful in landscape and HDR photography. In addition, Sony a5100 comes with a wider ISO range and a higher maximum ISO. If you specifically need a camera for snapping pictures of fast-moving objects, there is no other way than Nikon 1 J5. Otherwise, for more versatile usage, Sony a5100 is the way.